Are you a very busy woman? Do you have things to do? Do you have places to go? And, Are you busy with your babys? Do you have to work in the office? So, you don&apos;t have much time to select corporate clothing before you go to work. Here are combinations of office uniforms you can see. To make your life (and our lives easier), we concocted no-brainer outfit formulas that are chic (some embody a couple of this season&apos;s biggest trends), meet office dress codes, and can help get you to work on time. Study up on these five fail-safe uniforms, wear one each day of the week, and then repeat. We adore the slip dress this season, but its wispy silhouette and thin straps don&apos;t exactly scream professionalism. Cover up with a sleek sleeveless trench and slide into mules for comfortable strolls between meetings. Shop the look: Madewell waistcoat, $138; madewell.com. Wilfred dress, $145; aritzia.com. Aska mules, $195; askacollection.com. The neat juxtaposition between a sharp blazer and a pretty, feminine pleated skirt is why the two make for a perfect pair. Layer with an easy tee and finish with a sleek pump. Shop the look: Reiss blazer, $445; reiss.com. Theory tee, $75; theory.com. Zara skirt, $70; zara.com. Manolo Blahnik pumps, $595; barneys.com. 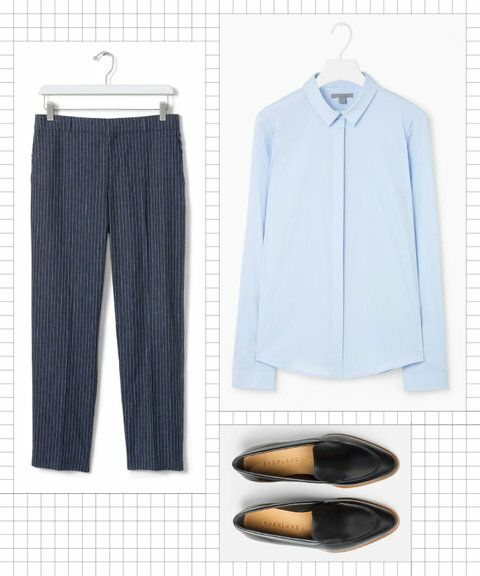 Balance the volume from your wide-leg culottes (ankle-grazing pants work, too) with a fitted top. Opt for a fine knit during spring&apos;s awkward temps and switch into a sleeveless version when it warms up. Shop the look: Trademark top, $160 (originally $228); trade-mark.com. Tibi culottes, $350; tibi.com. Stuart Weitzman pumps, $365; stuartweitzman.com. Master the borrowed-from-the-boys look with a sharp button-down and a sleek pair of pinstriped pants. Finish with a slighly undone low-slung ponytail, a bold red lip, and a selection of delicate gold jewelry. Shop the look: Cos button-down, $69; cosstores.com. Banana Republic pants, $88; bananarepublic.com. Everlane loafers, $170; everlane.com. The shirtdress is basically an instant outfit. If you&apos;re in a more corporate setting, step into pumps to finish your look. For a more summery feel, go for a darling block-heel sandal. 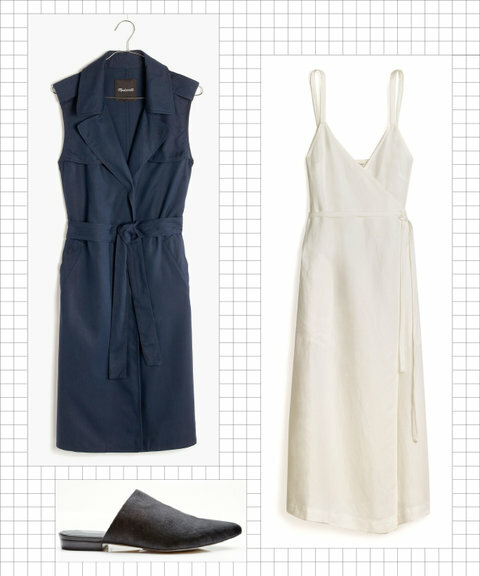 Shop the look: Equipment shirtdress, $270; net-a-porter.com. Diane von Furstenberg sandals, $248; shopbop.com.